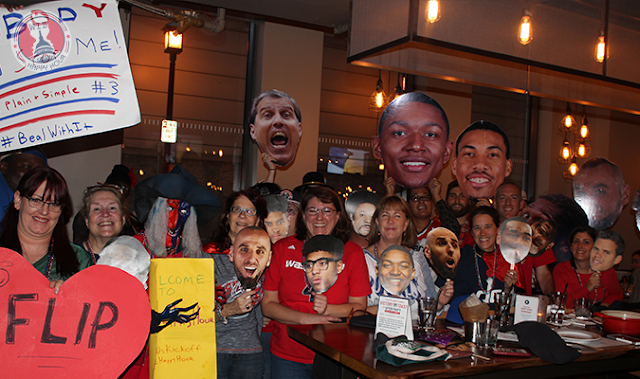 Washington Wizards Fan Happy Hour: Halloween Home Opener Welcomes Home The Wizards & The First Wiz Toast! 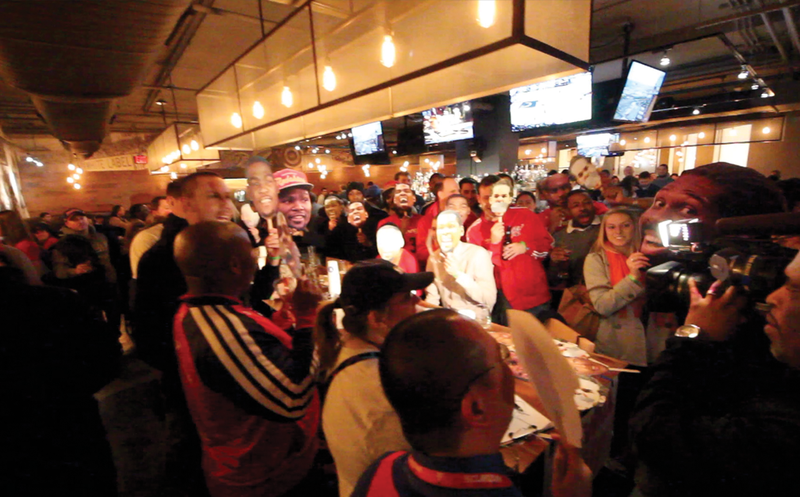 Halloween Home Opener Welcomes Home The Wizards & The First Wiz Toast! The Wizards finally returned to Verizon Center for the home opener and Wizards fans represented at Penn Commons for a Halloween Happy Hour. We had a costume contest, gave away prizes, sipped on Wizards punch and talked about the upcoming season. Here's what you missed! We had a really fun group of fans and they showed up early. By 4:15 the crowd was already starting to form and the tables were filled with the neon blue Wizards Punch drinks. The game was still 2 hours away but people were getting excited. Penn Commons was once again a great host and we filled up our reserved section rather quickly. We did all our classic photos, chilled with the big heads and donned player masks as we enjoyed the $5 all day all night happy hour. They also gave out 2 $50 gift cards to 2 lucky Wizards fans! (Yep, we do prizes at all our big events). There were several people dressed up for Halloween and there were lots of great Wizards themed costumes. 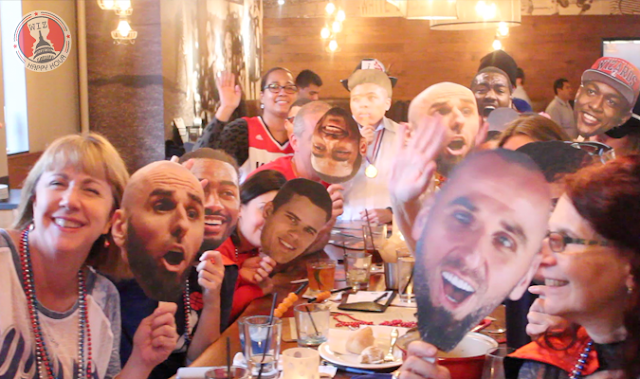 We had Jason Wall, Super Gortat, a Bavarian Wizards beer man, a Jerry Stackhouse Sasquatch, a Wizards girl and even Marcin GorCAT. Great costumes and a lot of fun people. Wizards Girl took home the championship and walked away with a Kelly Oubre autographed photo. Several people wanted to head in to see the Wizards opening night festivities, and just as a group went to the game a second group walked in, and yada yada yada I didn't get into my seat until the end of the 2nd quarter. 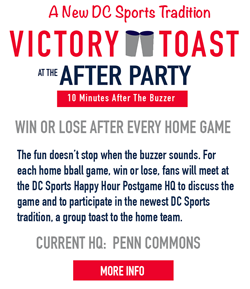 Wiz Happy Hour also gave away our first free Wizards ticket of the season. We also had FOUR FREE TICKETS and nobody to give them to. Just to let you know, you don't have tickets to the game to join us for pregame. You never know when a ticket is going to pop into your hands! When the game was over (as we will after every home game) fans met up at Penn Commons again for some angry game review and drinks to soothe our sorrows after the loss. Still just $5! 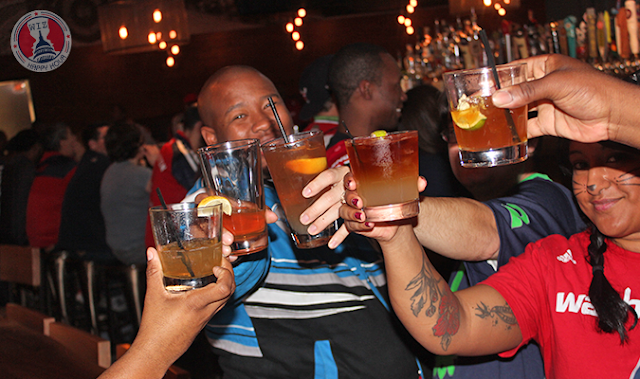 If you can't make the happy hours be sure to stop by after! Hoping for the first Victory toast this Wednesday! See you out there & Go Wiz!! !